October 27, 2011 - In the past 11 months, Randy Babbitt, Administrator for the FAA and Ray LaHood, Secretary of the Department of Transportation have worked to raise public awareness about the dangers of shining a laser at an airplane or helicopter. Unfortunately, however, these dangerous incidents are still on the rise. As part of our ongoing effort to stop these threats to pilot, crew, and passenger safety, the Federal Aviation Administration has launched a new website. The new site includes statistics, research on the dangers lasers pose, and links for reporting laser incidents. It also features downloadable videos. Pointing a laser into the cockpit of an aircraft threatens lives. As FAA Administrator Randy Babbitt said, ?As a former commercial airline pilot, I can tell you that shining a laser into the cockpit of an aircraft is a serious safety risk. Lasers can distract or temporarily blind pilots who are trying to fly safely to their destinations and could compromise the safety of hundreds of passengers.? The FAA takes this seriously; the aviation community takes this seriously; and law enforcement agencies take this seriously. Yet, through October 20, pilots have already reported 2,795 laser events for 2011. Reports for this year are likely to top 2010's record of 2,836 incidents. In fact, laser event reports have increased steadily since 2005, when the FAA created a formal reporting system to collect information from pilots. Part of the early increase from 300 in 2005 to 1,527 in 2009--can be attributed to pilots, air traffic controllers, and the public becoming more aware of the dangers and calling local authorities. But the dramatic rise cannot be explained away that easily. Portable laser pointing devices are less expensive, more powerful, and more readily available than ever. And people seem unable to resist the very dangerous temptation to shine them at aircraft. But the FAA has also been more active than ever in trying to protect the safety of pilots, crews, and passengers. In June, the FAA announced it would start imposing civil penalties of up to $11,000 against people pointing a laser into the cockpit of an aircraft, and the agency is currently working on 18 civil penalty cases. The FAA also worked with Myrtle Beach, SC, to develop a law making it illegal to point a laser at an aircraft. In September, Myrtle Beach passed its law, joining a number of other states and communities who have recognized the dangers lasers pose. ?The website FAA Administrator Babbitt launched today at the Air Line Pilots Association "Laser Illumination Conference" is another step in this ongoing pursuit of safety. And I urge you to visit the new site and share it with your friends. ?Safety is our absolute number one priority, and we will do everything we can to get the word out about how dangerous it is to point a laser at an aircraft. These incidents must stop?. The three most common physiological effects associated with exposure to bright lights are; Glare ? Obscuration of an object in a person?s field of vision due to a bright light source located near the same line of sight. Flashblindness ? A visual interference effect that persists after the source of illumination has been removed. And an Afterimage ? A transient image left in the visual field after an exposure to a bright light. The demands on a pilot?s vision are task dependent and frequently change according to the particular phase of flight and current visual conditions. Of principal concern to aviators is the possibility of being illuminated by a laser during terminal operations, which include approach, landing, takeoff, and departure maneuvers. 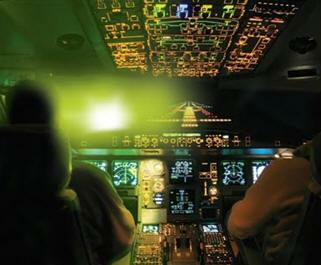 Pilots conducting low-level flight operations at night are particularly vulnerable to accidental or malicious laser illumination. During these activities, the pilot?s visual workload is highest, and the time to recover from exposure to a visually debilitating light source is minimal. Should distractions or physiological impairment disrupt cockpit procedures, flight crew coordination, or communication between the pilot and air traffic control personnel during critical phases of flight, the consequences could be catastrophic. On October 30, 1995,At approximately 6:30 pm PST the first officer on Southwest Airlines flight 1367 sustained a debilitating eye injury after being irradiated by a laser beam on departure from McCarran International Airport, Las Vegas, NV. The airplane was enroute from Las Vegas to San Antonio, TX, climbing through 7,000 feet MSL, on a standard instrument departure route when the incident occurred. The pilot-in-command (first-officer) reported that the laser beam sweep through the cockpit, resulting in temporary blindness and pain in his right eye, in addition to after-image effects that impaired the vision in his left eye. The pilot could not focus or interpret any instrument indications and was disoriented for several minutes requiring the captain to assume control of the aircraft (13). Note: As a result of this incident, the Federal Aviation Administration (FAA) placed a moratorium on outdoor laser activities in the Las Vegas area. On November 29, 1996, a suspected laser beam illuminated a Skywest Airlines pilot during approach on flight 5410 into Los Angeles Airport (LAX). The Embraer EMB-120 was over a college campus on visual approach to LAX from Bakersfield, CA, when the incident occurred. The aircraft was on a right base leg, level at 6,000 feet MSL, when the captain was exposed to a bright light in his right eye while looking for downwind traffic through the right window. As the flight continued, the captain found it increasingly difficult to see because of the burning and tearing he was experiencing in that eye. On final approach, he relinquished control to the co-pilot who completed the landing. Examination revealed the pilot suffered multiple flash burns to his right cornea (14). Note: As a result of this incident, the National Transportation Safety Board (NTSB) recommended the FAA change the existing guidelines to protect pilots from temporary visual incapacitation and to conduct research to validate laser exposure limits.